i can say that for the most part, shows have been a little better this year. i am also being very frugal in my spending – on everything. any ‘extra’ $$ must go to keep us afloat – house-wise. tom’s work remains spotty as everyone tightening their belts and car maintenance often put off till emergency status. candace’s unemployment has expired and she has just one daycare client – hey, at least it’s a start!! my part time work has gone to very minimum and now done entirely from here. still, i am very grateful!! i did get a lovely commission recently – 5 of the nearly nouveau blocks that i designed a simple setting for. 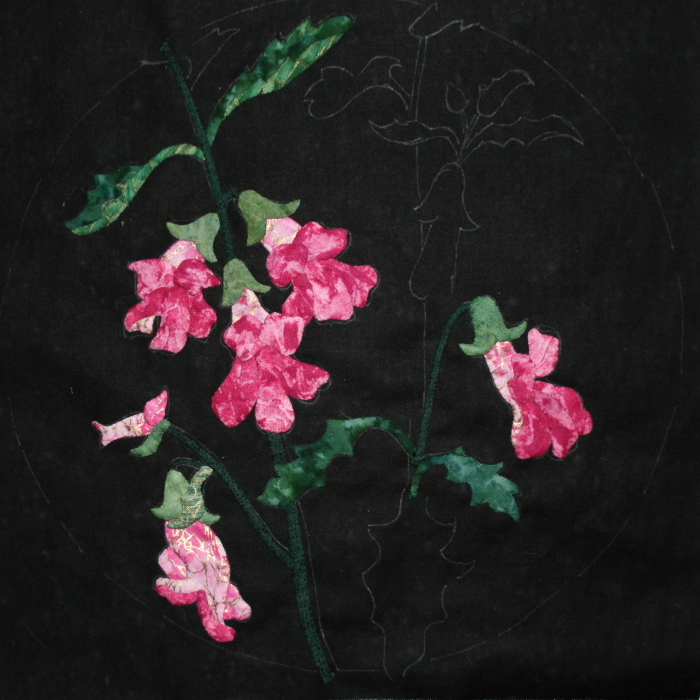 i will do the applique and the piecing – she will have it quilted. we didn’t get to who does the binding. ^_^ i have been working on the first block – couldn’t start right away as i was out of town most of may. and then had 2 shows in june. i am attempting to get myself back to it today – thought i’d share the progress here. at least it’s a picture! ^_^ hmmm, now i’m thinking i did share about the wallhanging and posted a picture of my ‘pasted up’ design?? so here’s block #1 – almost. oops, must have hit a wrong key – had the picture and then it disappeared when i went to type. let’s try this again – ok, all is well. and now i will return to needle and thread and see what i can accomplish.